Hand made cherry wood meat board. Show that special someone in your life that you care about their meat with this elegant hand made charcuterie board. Cutting area measures approximately 8" x 5.5". These charcuterie boards are custom and made to order, they can be monogrammed or made to specification. 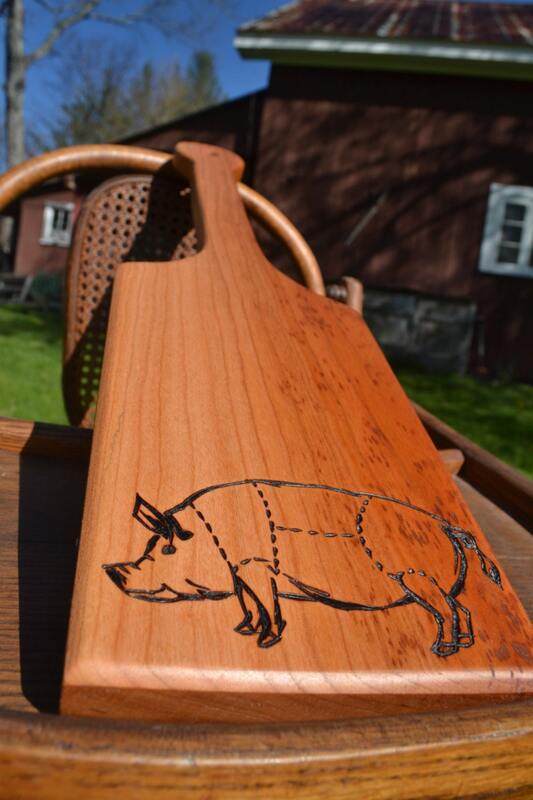 Price reflects the size depicted, please contact VT Paddle Co. for custom orders and sizes. All of our products are crafted using found, scavenged, reclaimed or sustainably harvested wood. The wood for this cutting board was sustainably harvested for hardwood flooring in town. Scrap pieces were then scavenged, milled and carved in Bondville, VT using minimal fossil fuels.